Apple announced this week that it has now sold three million iPads just 80 days after the product was launched in the United States. To put this in perspective, it took Apple 270 days to sell an equivalent number of iPhones and 2.5 years to sell that many iPods. Clearly Apple has a winner on its hands. What makes the iPad so special? We have completed our extensive testing of the iPad and present below our thoughtful impressions on the product and its usefulness for genealogy. •	Your inclination towards consuming online content versus creating new content. •	Your preference for a new more intuitive user interface versus the traditional interface of a conventional personal computer. 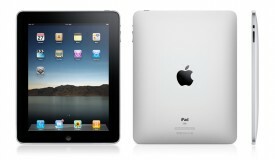 This is how the first version of the iPad looks.